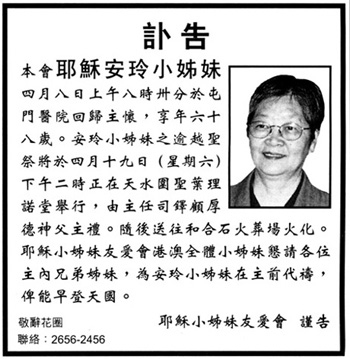 Sister On Leng, superior delegate of the Fraternity of the Little Sisters of Jesus, died peacefully at Tuen Mun Hospital on 8 April 2008, She was 68-years-old. The congregation requests your prayers for the repose of her soul. A Mass of the resurrection will be celebrated at 2:00pm on Saturday, 19 April, at St. Jerome’s Church, Tin Shui Wai, New Territories, followed by funeral services at Wo Hop Shek Public Cemetery, Fanling.